Quian Pullen talks about Chinese culture with her students. 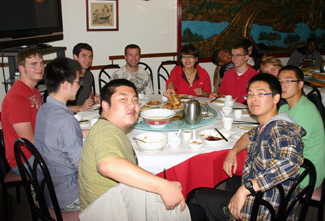 John Dykstra ’13 – Wabash students taking Mandarin and Chinese history classes had an engaging experience Sunday with Chinese culture. Professors Ssu-Yu Chou and Qian Zu Pullen led 31 students to Chinatown in Chicago. The essence of the trip was for students to develop a better understanding of what “oriental” entails. Students were introduced to Chinese breakfast and dinner customs at traditional Chinese restaurants; visited The Oriental Institute; and had the opportunity to free roam and shop in Chinatown. At The Oriental Institute, students viewed the Assyrian, Egyptian, Mesopotamian, Megiddo, Nubian, Persian, and Syro-Anatolian exhibits. Pursuing a degree in Asian Studies, Aaron Morton-Wilsonv’14 found more historical and cultural subjects to analyze through the museum. Students were fascinated by Chinese eating customs and cuisine. They particularly liked the breakfast custom of dipping a Chinese donut into warm soy milk and how there were several dishes on the table to choose from. The restaurants used a spinning plate in the center to help students serve themselves. Vietnam native Hoan Nguyen noticed differences between Chinese and Vietnamese foods and eating customs. Eating in true Chinese restaurants was part of the day's experience. Accustomed to American eating traditions, Lorenze Billups ’15 was captivated by how several Chinese dishes were shared using a spinning plate. Pullen’s underlying lesson to students revolved around analyzing cultural differences.